Gold and silver futures closed lower in regular trading Wednesday, and for the first time in three sessions, each retreating from about 12-week highs. Both moved higher in after-hours trade when the Fed released its latest monetary policy statement. Gold for February delivery shed $4.40, or 0.4%, to settle at $1,115.80 an ounce on the Comex division of the New York Mercantile Exchange. Gold prices ranged from a low of $1,114.90 to a high of $1,122.50. 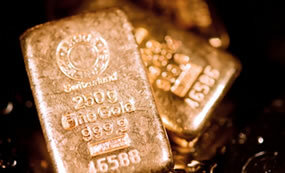 In electronic trading after the Fed news, gold prices moved toward $1,126 an ounce. "There seems to be a collective sigh of relief that this statement wasn’t hawkish," Bloomberg News quoted Tai Wong, the director of commodity products trading at BMO Capital Markets in New York. "The gold rally has dodged this bullet, and it’s an opportunity to take it higher." On Tuesday, gold prices gained $14.90, or 1.4%, to mark their highest close since Nov. 2. Silver for March delivery declined 10.5 cents, or 0.7%, to end at $14.459 an ounce. Silver prices traded from $14.36 to $14.55. They rallied 31 cents, or 2.2%, in the previous session, closing at their best point since Nov. 6. The precious metal was last near $14.50 an ounce in after-hours trading. April platinum rose $5.20, or 0.6%, to $882.10 an ounce, ranging from $871.40 to $885.50. Palladium for March delivery rose $9.50, or 1.9%, to $502.25 an ounce, trading between $492.40 and $504. Gold added $2.65, or 0.2%, to $1,116.25 an ounce. Silver added a nickel, or 0.4%, to $14.38 an ounce. United States Mint bullion sales advanced Wednesday with American Silver Eagles rising 199,500 and gold coins gaining a combined 14,500 ounces. The U.S. Mint this week limited sales of 2016 Silver Eagles to 1 million. By Wednesday, 92.7% of them were claimed, leaving 73,500 until more become available next week. Buyers have ordered a total of 5,926,500 since their launch on Jan. 11. That is the highest for a month since 7,498,000 sold in January 2013.